Keri from Commute Orlando once wrote about moving garbage cans out of the bike lane. I once wrote about moving a crippled car into a bike lane. Lots of people rant and rave about bike lanes being blocked by cars and delivery trucks and pedestrians and so on. When I come across a bike lane obstruction, I usually just go around it. No big deal, you know? Like anyone who's into swallowing weird stuff can can tell you, obstructions happen. There is just so much to work with here that I am paralyzed. I mean, this stuff has the potential for an almost infinite number of back-stories or at least sarcastic observations. When something can be interpreted in so many ways, I think it approaches the lofty status of Art; let us name it Obstructionism. You know how sometimes people post a picture and say "caption this picture"? Well, while my readers are few, I believe they have the chops to do much more than write a clever caption. If you are so inclined, please feel free to write a story or posit a theory based on any or all of these images... I started to try, but was so overwhelmed by the possibilities that I have come up with a contest instead. Best story or theory or whatever (as judged by me) will be re-published in a new post, and as with my only other contest so far, I will send the winner $5 in Canadian Tire money! Just put your observations, theories, stories or whatever in the comments of this post. All submissions must be at least three words in length and become the sole property of Willie Nelson and Spiderman unless you want to republish them for real, in which case they remain yours. I'm willing to wait a pretty long time to get submissions, so let's end the contest on July 1, 2010. The piano is a placeholder for the blue whale that was there only moments before. A friendly piano mover offered to take the whale back to the sea, but the whale was insistent that this was "his spot." The kindly piano mover promised that the piano would adequately hold the spot. 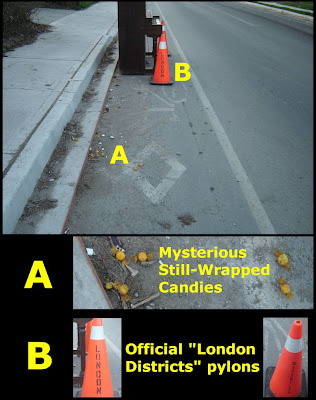 London highway workers being the courteous chaps that they are, thoughtfully put up the cones to alert cyclists that this spot does, in fact, belong to a blue whale. Hot damn, we're off to a roaring start, and just moments after I published the post. Thanks, Doohickie! Hey, wait, that looks like my old piano! Did you check to see if it was a player piano? How did it get from Everett, WA to London? Perhaps, we're entering - "The Rantwick Twilight Zone." Dedicated cyclist and car-free Liberace Jr., accompanied by his travel coach and security vehicle, arrives in London for his public debut Saturday afternoon. Junior insisted on performing in the bike lane on Fairfield Street for sentimental reasons. "This is the spot where daddy met mummy", he said. "Daddy was very secretive about his family. I thought the world should know his legacy lives on." 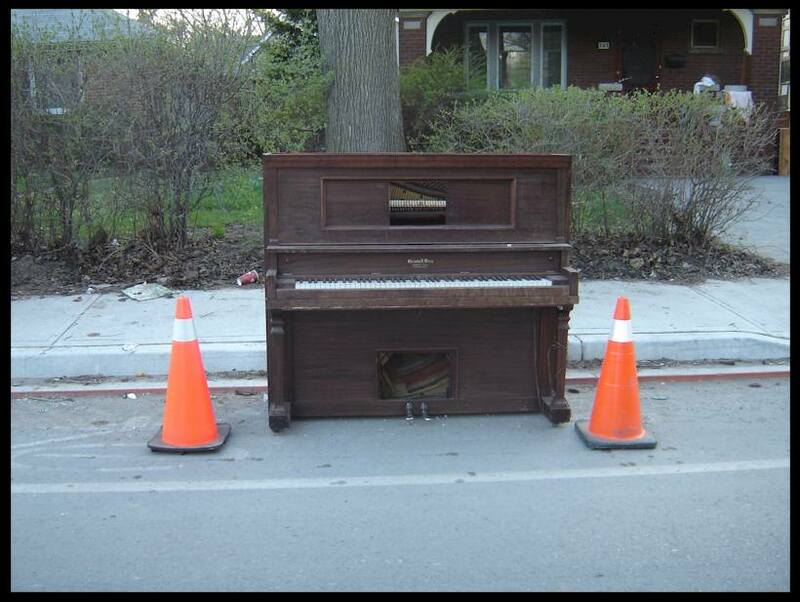 Hey, where is my piano bench? Great post mon ami! By the way, this remind me of my VLSR (Very Large Scale Reduction) that I did (got rid of things I don't need or didn't use) back in 2007 LOL! I think it is time for Blue's Cluez! Now, where did that piano come from? You mean none of you recognize a cunningly disguised CIA van when you see it? The candy is there to lure the dreaded canadian terrorists into their clever trap where they'll be captured and whisked off to a hidden interment camp and forced to listen to badly-played bagpipe and accordion music. Yes, Yesss... my plans are unfolding nicely. Thanks for the comments so far, everyone! I'm not a piano, but I play one in a bike lane. So when do I get my Canadian Tire Bux? Doohickie - Sit tight, man. The comment deadline is way out at July 1. Please also know that multiple entries are not only allowed, but encouraged! I've moved the following from a contest reminder post in the hopes of keeping all eligible comments in one place. The occupiers of Old South ran out of old automobiles to mess up the local commuters, so the began using pianos. They are a touch classier than discarded refrigerators. 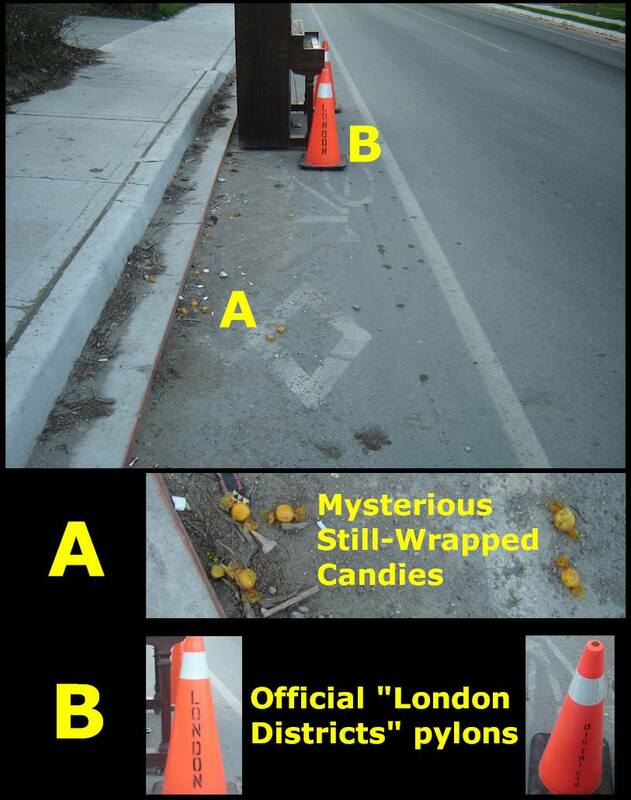 The real clues are not in the picture, but what's MISSING. Where are the following items? - Fancy little parasol in wobbly cyclist's beverage? I surmise that someone very annoying was playing the piano quite poorly in the house in the first photo. House mates became irritated and carried piano and player out to the curb, the pylons were already there to warn of a pothole so they simply covered the pothole with the piano, and moved the pylons. 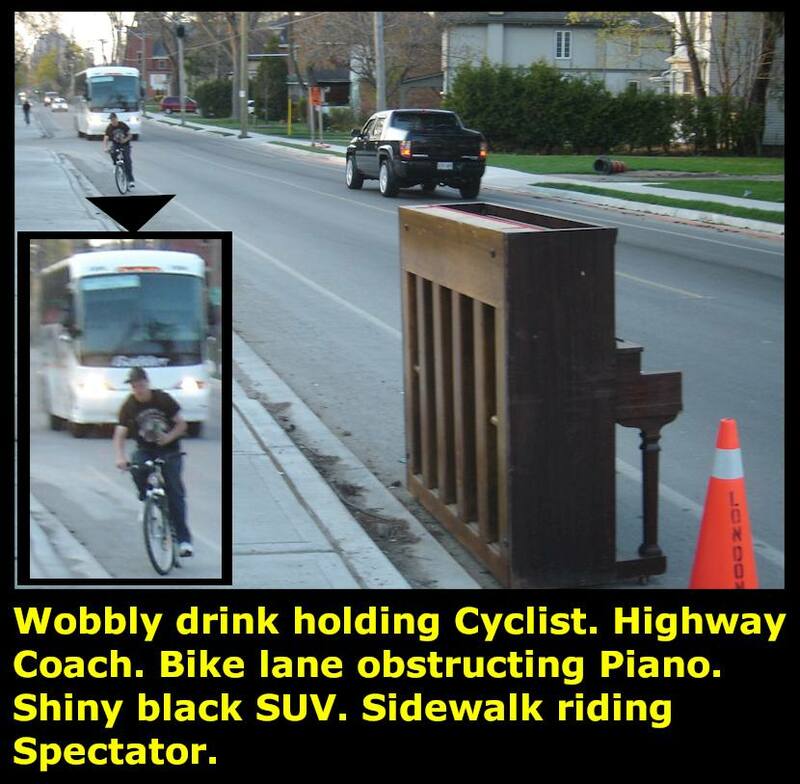 The piano player got thirsty, so his buddy rode off to bring back a drink for him, even though he was pissed at him, because he's just that kind of guy. He's returning to the house now, and wobbling because he is shocked that the piano player, bench, and lid are all missing. What he doesn't know is they are all in the shiny black SUV that's headed in the opposite direction. The bus is full of music fans who heard tales of a curbside piano player and have come for a show ... but once again, they do not know that the pianist is making his escape in the SUV. I think that explains most of it. Oh, the candy? Well, that's just weird. I really don't see what all the mystery is about. The cyclist is Danny McAskill (do watch this if you haven't, and I'm only disappointed you missed photographing his next manoevre which was jumpping from the pavement onto the piano, then onto the coach as it passed. He puts his drink down on the top of the cone on his way up, and picks it up on the way down, otherwise it would be too easy for him. The SUV contains his camera crew, ready to do a hanbrake turn and add extra pizazz to the film. What you do not draw attention to is the masonic symbol ("A" in your big picture) which is in itself much more interesting. It is from the James Bond Lodge "Diamonds Are Forever" who famously hold ceremonial initiations every time a piano appears by the roadside, being a sign from the heavens that momentous events are afoot. Thanks for the additional submissions, all who made 'em. Deciding upon a winner is going to be very difficult. I may narrow it down and have people vote, I don't know. Ham - Yeah, I posted on that miraculous video, and still watch it once in a while.